Andre Drummond has put up impressive stats for the Detroit Pistons this year, and deserves his spot amongst the NBA's best. The last player from the Detroit Pistons to make the NBA All Star Game was the infamous Allen Iverson, way back in 2009, ending a stretch that had seen Pistons players make the team every year since 2003 when Ben Wallace made the squad. Andre Drummond, the Pistons 7'0", 22 year old, center from the University of Connecticut looks to start a new streak of Pistons appearances in the All Star Game much like Wallace, also the Pistons center at the time, this weekend. So what makes Andre Drummond deserve a spot in the All Star Game? First of all, the Pistons have a record over .500 for the first time in years, and look poised to earn their first playoff spot since the 2008-09 season, when they got swept by the Cleveland Cavaliers in the first round. The Pistons last won a playoff game the year before, when they were defeated by the Boston Celtics in a 4-2 series defeat in the Eastern Conference Finals. The Pistons, led by Andre Drummond, might be able to accomplish both feats again this year under Stan Van Gundy. Andre Drummond has really taken the NBA by storm this season , leading the Pistons to several key wins, including a victory over the nearly unbeatable Golden State Warriors. Drummond has averaged 17 points per game, and 15 rebounds per game so far this season, putting him at the top of the league in rebounds, and tied for third in points amongst centers in the NBA with Jahlil Okafor, behind only DeMarcus Cousins of the Sacramento Kings and Brook Lopez of the Brooklyn Nets. This has given Drummond an impressive 38 double doubles, with Russell Westbrook of the Oklahoma City Thunder being the only other NBA player over 30 with 31, seven behind Drummond. At the current pace, Drummond could get as many as 75 double doubles, which would pass Hakeem Olajuwon for the most in a single season in NBA history, with the current record of 72 being set in 1993. Using the 15 rebounds per game total so far as an ability estimate, we will use that as an estimate for 50% of a perfect rebounding total (since the most amount of rebounds he's earned this season is 29, this makes sense). Since 15 is also his mean (average) ability so far this season, it should be as accurate as possible (without using too many complicated decimals!). After conducting a digital simulation of a season (82 trials) it was found that his ability to get 15 rebounds per game to be 40/82, or around half the games he has played in. After conducting a similar trial in which only numbers 1-30 were used (instead of the 1-1000 used before), where each number represented the number of rebounds earned per game, it was calculated that he pulled down 15 or more rebounds per game in a simulated season about 41 times, or 50% of the games. After conducting similar trials 10 more times manually, the maximum number of rebounds per game over the course of a simulated season calculated was 45 (the minimum was an outlier of 33, with the average being 41, as expected). 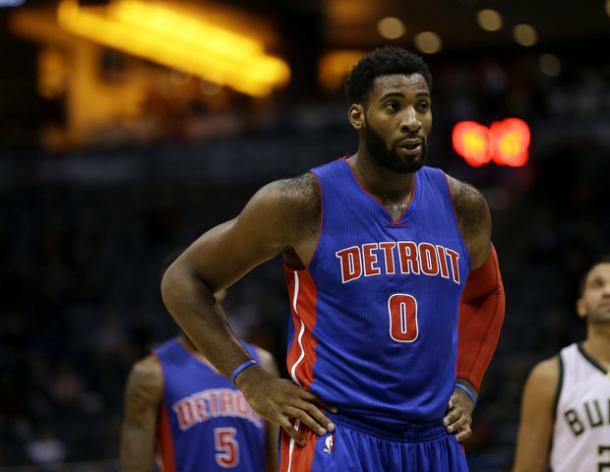 How do these numbers show Andre Drummond's successes so far? Drummond has already pulled down 15 or more rebounds in 26/46 games, or about 56% of his games. Out of the ten trials conducted, the highest percentage of games he earned 15 or more rebounds in was 45/82, or 54%. This means, Andre Drummond has performed better in real life 100% of the time compared to a digital simulation of predicted values. To confirm these suspicions, it was decided to conduct more trials except through the 46 games played so far this season, instead of a virtual season of 82 games. Using the same processes as above, it was found that his best simulated performance through 46 games was 25 games of 15 or more rebounds through 10 trials. Once again, Drummond has performed better in real life, than any of the digital simulations of a season that had been conducted. While rebounds are only one stat that can be used in measuring ability, it is one of the most important stats for a center in the NBA, and in this case clearly shows Andre Drummond has performed better than his counterparts in the rebounding category so far this season. In conclusion, it was found that due to the number of simulated performances being greater than his actual performance zero times out of 20, Andre Drummond has had a statistically significant season, and definitely deserves a spot on the Eastern Conference's All Star Game roster.